It took him 70 days, 19 hours and 37 minutes all alone at sea but Isaac Giesen has accomplished what he set out to do: the Christchurch man has become the first Kiwi to row across the Atlantic Ocean. Giesen left the Canary Islands, in Spain, in December and arrived in Antigua yesterday, after traversing the Atlantic on a journey of 3000 nautical miles. The Kiwi did it to raise $1 million for mental health awareness in Australia and New Zealand. Giesen has lost his aunt and two close friends to suicide. 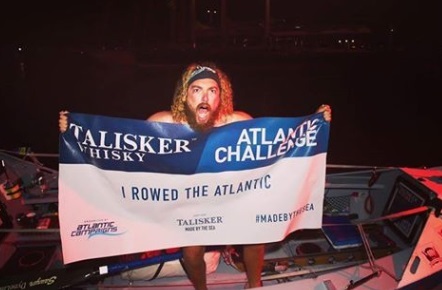 The exciting moment Giesen arrived in Antigua was broadcast live on the official page of the Talisker Whisky Atlantic Challenge 2018. He said at the time he was "good, but overwhelmed" about what he had achieved. He also admitted that he didn't really want the challenge to end. "A wee bit sad from finishing — I kind of didn't want it to end. But quite emotional as well at the same time, just what I accomplished and what I did it for," he said. Giesen has so far raised nearly $50,000 for mental health. To donate or find out more, visit The Blue Rower page.